Experience the fun and excitement of being a real Pet Trainer! Choose from 6 of your favorite animals including dogs, horses, cats, mice, rabbits & parrots! Build the country’s best Pet School by giving your pets plenty of healthy food, exercise and love as you train them! Teach parrots to speak and sing for a street performing act in the park. Train rabbits and mice to jump and run on a wheel for an upcoming competition. Coach cats to complete an obstacle course for a feature roll in a comedy film. Challenge dogs to jump over obstacles for stunts in an action movie. Guide your horses through an equestrian course to win the blue ribbon! Way To Go! 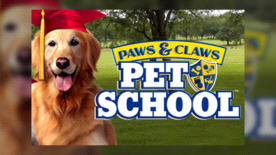 You are the proud owner of your very own Pet School. Care for, love and train your best friends to be amazing animals that have amazing jobs! Become the Best Pet Trainer in Town! Choose from 6 different kinds of animals to train for amazing stunts, tricks and jobs. Design your own Pet School! Choose your buildings and create great training arenas for all of your animal friends. Customize your character & go shopping! Choose to be a boy or a girl, then select from 1,000+ cool outfits combinations. Care for your animals! Feed, exercise and clean their kennels and stables to keep them healthy and happy! Teach your animal friends up to 14 unique tricks and reward them with treats or they may not respond to commands! Attend the Academy to improve your training abilities, grow your school and earn the trust of pet owners.